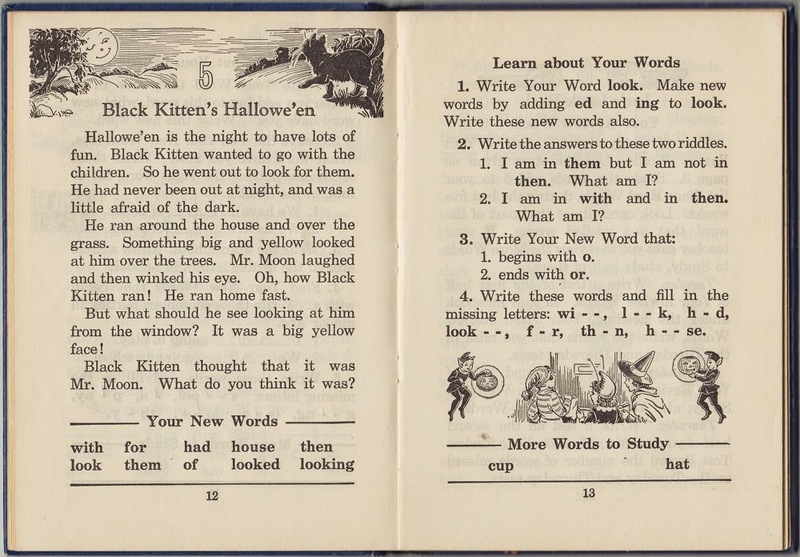 This spelling textbook was first published in 1930 with a second edition published in 1932. It was published a third time in 1950, so I most likely used this book in grade two. Textbooks were used over a long period of time as this book has a stamp on the inside front cover "LANGFORD SCHOOL" and another stamp with the date "SEP 10 1964". The illustrations are delightful, they capture a childhood innocence that is not present in the modern day celebration of a holiday that takes place at night. 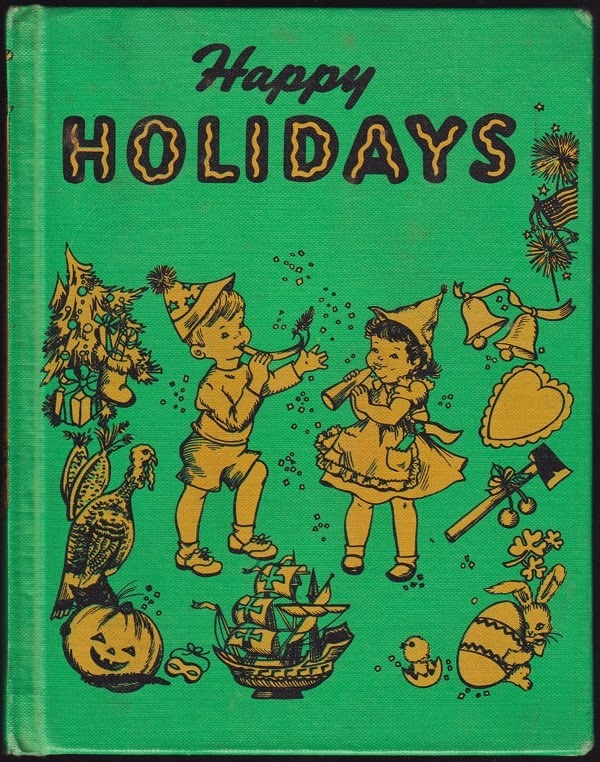 Karen, a collector friend, gave me this "Happy Holidays" children's reader for Christmas one year. The name is appropriate don't you think? 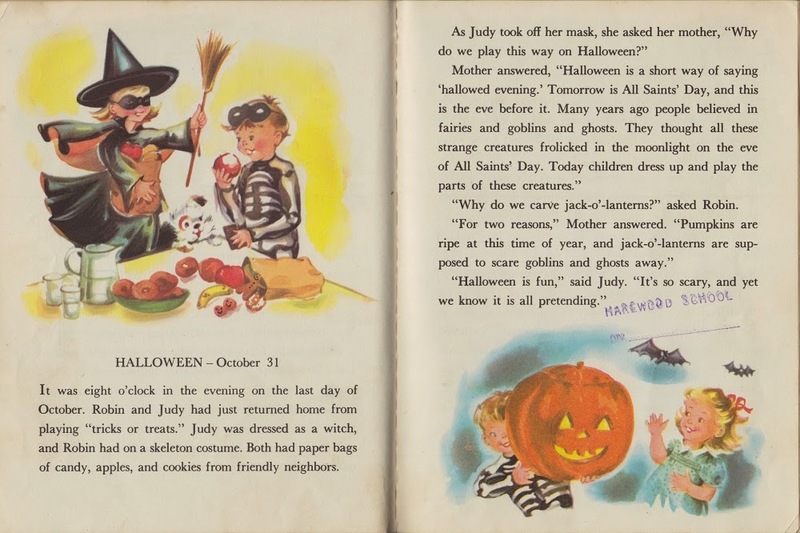 and other fun days around the year"
Here is the chapter for Hallowe'en. I will post other chapters during the year as the holiday approaches. I discovered this pencil drawing on a sheet of newsprint several years ago. I must have been in grade 5 when I drew it. I'm not sure where it turned up, it could have been at my Mum's place when we were tidying some things or it could have been tucked into something here at home. I am so glad that I found it. 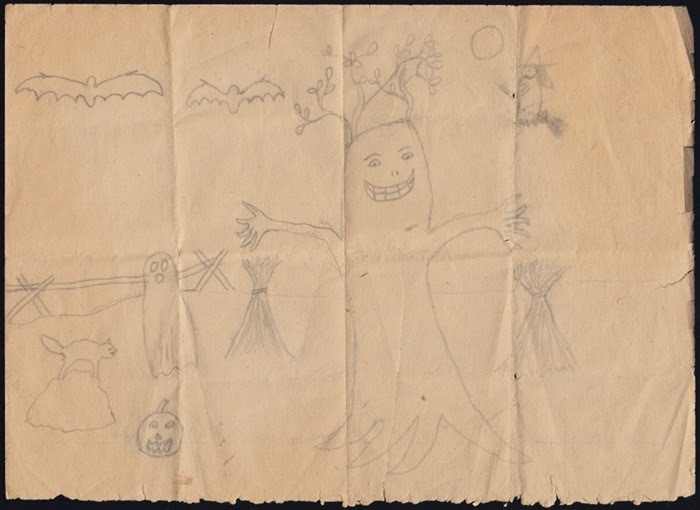 I crammed in every image that goes with Hallowe'en that I knew; a split rail fence surrounding a field of corn shocks, a tree... with a face, a ghost, a carved pumpkin... I never called it a Jack-o-Lantern just a carved pumpkin, a black cat that may be on a rock or a pile of leaves, who knows, two bats, a moon, and a witch on a broom. Thanks for sharing this delightful book!